Apple's newest operating system increases battery life by 25% to 30% with a simple software update. Rolled out to around 50 million Mac computers, this increase in energy efficiency is going to add up to a lot of reduced energy consumption and greenhouse gas emissions. I'm going to try to calculate just how much. It was the above graphic from John Siracusa's excellent review of the newest Mac Operating System OS X Mavericks, that really grabbed my attention. To increase the battery life by between 25% to 30% as John measured, the system must use power more efficiently - 25% more battery life means 1/1.25 = 20% more efficient. I'm going to walk through a few more back-of-the-envelope calculations and to take a guess at how much electricity and green-house gas emissions that will add up to in the next year. According to Horace Dedieu of Asymco Apple had sold 122 million macs in all time in February of 2012. Let's conservatively estimate that those sold in the last 5 years are still in use - this equates to about 50 million - a few more may have sold since then, but it's a nice round number, that I used in my opening paragraph, and as I said in the title - this whole article is a big guess. 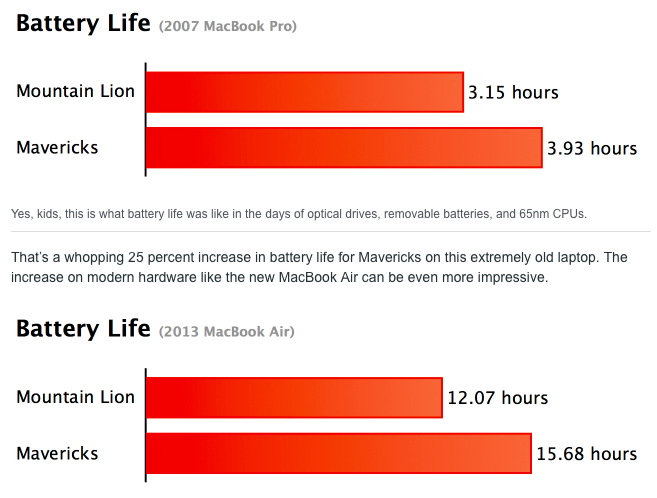 Another big guess is the adoption rate of Mavericks. This year the upgrade is free, and adoption is expected to be unprecedented for a desktop OS. One source is currently quoting 17% in under a month from Maverick's release date. I'm going to pick 20% as a nice round number for the first 2 months after it's release. It's at this point, that I realize I don't have a good figure for average energy use for a laptop during it's lifetime. I could assume 8 hours per day, 50 weeks per year, for a lifetime of five years, but I think usage of computers varies widely, and the people who probably know best how much an average person uses their Mac is probably Apple. 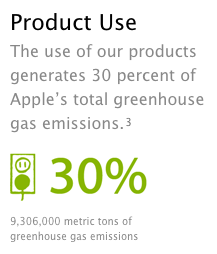 Then I remembered that Apple provides some first class sustainability and environmental impact reports on it's website. There are impact statements for all it's products, as well as the environmental impact of the organization - including the life-cycle of it's products including use. They chalk-up 30% of their carbon-footprint as due to product use - and they even provide the figure of "9,306,000 metric tonnes of greenhouse gas emissions." Digging a little deeper into those product impact statements. I see the most popular Mac Laptops at 350kg of CO2e for each computer and between 17% to 33% of that due to customer use (electricity). A recent iMac is put at 1000kg of CO2e - 50% for customer use, and an iPhone 4s at 55kg and 25% of that for customer use. Apple sells an overwhelmingly large number of iPhones as compared to the number of Macs sold, but from the impact statements we can see that the Mac Laptops use 6 times as much energy as iPhones. It's hard to be precise on this, so I'll make another guess that Mac Laptops are responsible for about 50% of Apple's product use GHG emissions, or 4,653,000 tonnes of GHGs. Unfortunately for me, since I'm most interested in energy savings in kWh (saving energy is what I do for a living) I don't know the conversion factors and assumptions Apple made in determining these GHG totals. Still, estimating how many GHGs will be saved is an equally interesting figure to me, so I will continue. Going with my 20% adoption rate by the end of 2013, the computers that will now have Mavericks on them would have been responsible for 930,600 tonnes of GHGs. In 2014, but using power more efficiently, these machines will only generate 744,480 tonnes of GHGs for a savings of about 186,120 tonnes. There we did it - a back-of-the-envelope guess, but it could be in the ballpark. With one software update, by providing better battery life and making it's operating system more responsive, Apple has also eliminated 186,000 tonnes of greenhouse gas emissions per year. To put this in perspective, a person living in British Columbia, Canada generates on average 5 tonnes of GHG emissions each after all the driving, keeping our houses warm, and sending things to the landfill we do each year. So that's the carbon footprint of a small city of 37,000 people. Here's another datapoint for comparison: the BC government tracks it's greenhouse gas emissions and offsets them for carbon neutrality. 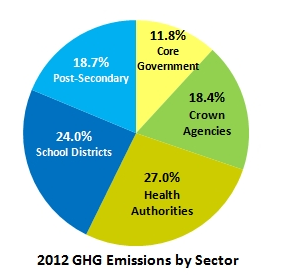 In 2012 all the provincial government, schools, advanced educational institutions, and health-authorities reported using a total of 845,212 tonnes. So one software update that saves 186,000 tonnes per year is as significant as it is impressive.